Is a Top California Democrat Courting GOP Voters in His Bid for Governor? California, which Hillary Clinton won by nearly four million votes in 2016, has become ground zero for the burgeoning "resistance" movement against President Donald Trump. The state's political leaders have openly clashed with the Trump administration on issues far and wide, including border security, the travel ban, vehicle emission standards, and the decennial census, to name a few. Yet one Democrat appears to be actively courting Republican voters in his bid to become governor of California. On paper, Antonio Villaraigosa seems like an unlikely choice for California's shrinking GOP electorate to rally around. A former speaker of the California State Assembly and mayor of Los Angeles, Villaraigosa got his start in politics as a union organizer. In 1994, as a newly minted state legislator, he cut a progressive profile by championing legislation to raise income taxes on California's highest earners and expand access to health care. As mayor, Villaraigosa trumpeted gun-control measures and promoted tax increases to pay for expanding Los Angeles's transportation infrastructure. It looks likely, however, that the California Republican Party will be locked out of this fall's general election for the state's top political office. This increasingly plausible scenario is made possible by the state's "jungle" primary system, which pits members of all political parties against each other on one primary ballot, with the top two-vote getters facing off in a head-to-head matchup in the general election. Polling in the race has shown Gavin Newsom, the incumbent Democratic lieutenant governor, consistently in first place, with a close two-man race for second between Villaraigosa and John Cox, a Republican businessman. Villaraigosa seems best poised to use the dynamics of the primary system and California's political landscape to his advantage. His strategy appears to be premised on forming a coalition of Latinos, moderate Democrats, independents, and Republicans. To that end, Villaraigosa has staked out positions antithetical to those of the state's increasingly left-leaning Democratic Party, placed a longtime GOP political consultant on his payroll, and cultivated the image of a "uniter" above partisan politics. He has also devoted a significant portion of his time to making inroads with California's conservative-leaning agricultural community. The Villaraigosa campaign did not return requests for comment. Bolstering Villaraigosa's crossover appeal is the fact that he does not present himself as a conventional Democrat on the campaign trail. Shortly after jumping into the race, he told Randy Shandobil's podcast, "The Golden State," that his top priority as governor would be "jobs, jobs, jobs, and the economy." 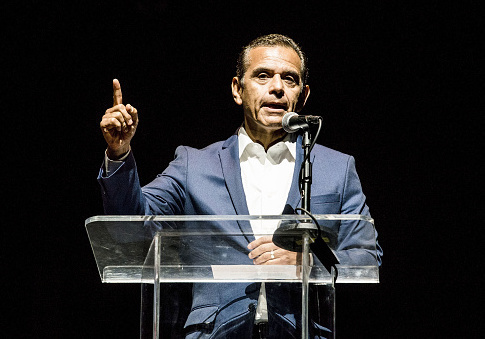 While barnstorming the state, Villaraigosa is as likely to tout his support for gun control and opposition to a wall on America's southern border as he is to discuss the merits of charter schools and the need to reform the stringent California Environmental Quality Act, which critics say has led to the state's housing shortage. Unlike the majority of Democrats in the race, including Newsom, Villaraigosa has been openly skeptical of single-payer health care. He has argued on numerous occasions that, while he supports the idea in theory, it is not financially feasible. Villaraigosa has also expressed reluctance to support tuition-free college proposals, contending California should focus on making higher education free for those who desperately need it, like the "absolutely destitute." A central theme of Villaraigosa's campaign is bridging the economic divide between rural and urban California, a problem he says can be solved by reigning in the state's penchant for new and greater regulations. In an op-ed unveiling his economic development strategy, Villaraigosa declared that California needs to "rethink" its "one-size-fits-all approach to economic policy and regulation." "A regulation that is a small annoyance for a thriving business on the west side of Los Angeles could be a job killer for an industry in the Inland Empire," he wrote. Villaraigosa started to open his eyes to the regulatory burdens affecting California businesses while serving as mayor. "When I served as speaker of the state Assembly, I was not shy about passing bold new laws and new mandates," Villaraigosa wrote. "But as mayor of Los Angeles, I learned that statewide mandates, regulations, and interventions didn't always make sense from a local perspective." "What seemed easy from the Capitol building is a whole lot more complicated up close," he added. The most overt attempts to court Republicans have come from Families and Teachers for Antonio Villaraigosa for Governor 2018, an independent expenditure committee supporting the mayor. The group, funded by prominent charter-school advocates like Michael Bloomberg, has put John Cox, who recently garnered Trump's endorsement, in its crosshairs. The attacks have only intensified as the June 5 primary date nears, with the group running ads and sending out mailers to GOP households lambasting Cox's "liberal record" and his donations to Rep. Nancy Pelosi (D., Calif.). The group even launched a website attempting to "expose" the Republican as a "Chicago lawyer" who is "unelectable." Meanwhile, Families and Teachers has also bought ad time highlighting Villaraigosa's record on conservative issues like working with GOP lawmakers to balance the state budget and putting more cops on the streets to tackle gang-related violence. Families and Teachers for Antonio Villaraigosa for Governor 2018 did not return requests for comment for this story. The mayor has raised nearly $1 million from normally GOP donors and has raised more money from California's agricultural sector than all GOP candidates combined. Villaraigosa's strategy seemed to be further vindicated Wednesday when he received the endorsement of Meg Whitman, the 2010 California Republican gubernatorial nominee. Villaraigosa and Whitman, a onetime CEO of Hewlett Packard, bonded over their shared views on education reform and charter schools, according to the Los Angeles Times. Bill Whalen, a research fellow at the Hoover Institution and former media strategist to California Republican governors Arnold Schwarzenegger and Pete Wilson, told the Washington Free Beacon that Villaraigosa's appeal to voters outside of the traditional Democratic camp is strategic, especially given how entrenched the support is for his chief opponent on the left. "California is a big, constantly changing state with a short attention span," Whalen said. "Villaraigosa has been out of the political eye since 2013. He hasn't been running for office as long as Newsom and doesn't have his name recognition." Whalen pointed to Newsom's high-profile, largely ceremonial role as lieutenant governor and his advocacy on behalf of statewide ballot initiatives to legalize marijuana and enhance gun control as having endeared him to progressives. "If you go any further left than Gavin Newsom … you're in the ocean," Whalen joked. "Villaraigosa's decision to run a center-left campaign is smart and reflects the reality of this race." Whalen predicted that in a contest between Villaraigosa and Newsom, the former Los Angeles mayor would be best positioned to build a wide and diverse electoral coalition. That said, "In a head-to-head matchup with Newsom, don't expect Villaraigosa to campaign as a born-again Republican. He's going to pick and choose the issues that will best appeal to Republican and independent voters, without dampening his Democratic credentials." This entry was posted in Politics and tagged 2018 Election, Antonio Villaraigosa, California, Democratic Party, Jerry Brown, Republican Party. Bookmark the permalink.